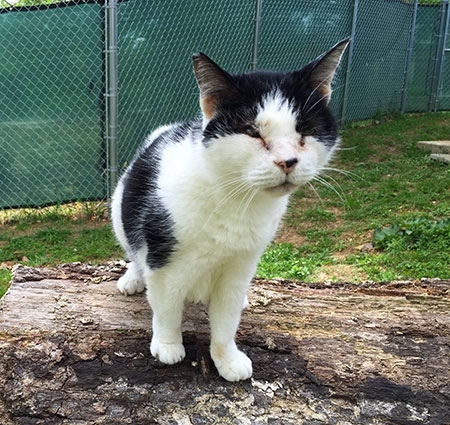 Our passion for blind cats began with one cat, Missy. She was found as a stray on the Stanford University campus in the early 2000's. She had a funny notch in her ear and one blind, turned in eye. The rescue group boarded her at a vet's office until she could be adopted. Well, no one would. She was passed over again and again. Many people said she should be put down as she was not only "funny" looking but terrified. Our founder just had a beloved kitty pass and was looking for another special needs cat to love. Missy rode the whole way home with her head buried in her arm. It took Missy two years before she was able to fully trust and wander around with confidence. But when she finally did, she declared herself the Queen and nobody was going to dethrone her! She was first on any lap and insistent on snuggling. Missy was such a joy. Always happy, never aggressive even when Maggie Mouse playfully pounced on her. A couple of months ago, we noticed Missy was losing weight fast. After several tests, she was found to have intestinal cancer. We made her as comfortable as possible knowing our time with her was short. While it's never easy to say goodbye, Missy told us when it was time and she was ready. We held her and told her we loved her as she transitioned over the Rainbow Bridge. Rest in peace, sweet girl. We miss you so much.